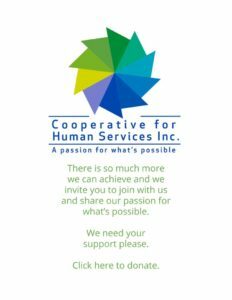 Cooperative For Human Services, Inc. provides corporate legal guardianship services on behalf of more than 100 individuals living throughout the Commonwealth of Massachusetts and our Guardianship services are available throughout the state. As an approved guardianship service provider, we are appointed through a court preceding that grants legal authority and determines the level and scope of the guardianship services. Court decrees (orders) are based upon individual abilities and personal situations, therefore decision-making authority varies. People seek professional guardianship services for many reasons. Often our services are sought when immediate family members or other relatives are no longer able or available to provide continual direct assistance and essential oversight of a person’s needs. Our Guardianship Representatives are knowledgeable professionals who make a personal commitment to provide ongoing advocacy and assistance thereby ensuring that the needs of the people we serve are understood and addressed. Our representatives work closely with all involved, are readily accessible, and provide emergency on-call assistance 24-hours per day. The Corporate Guardianship Program provides vital advocacy services through active support, material decision-making, and the protection of individual rights and entitlements.